With Earth having been abandoned as a toxic waste dump and humankind fleeing off to space, the mechanized Orbots must stay behind to clean up the mess. When the Orbot leader, WarHead, starts blowing a few circuits and causing a war among the mechanical brethren, a sludge barge pilot named Vectorman is the only one willing to step up and fight him. You'll morph into a speeding train, a power drill, a mechanical fish, or a mighty dune buggy in this zany, original warfare adventure. Using three awesome power-ups, you might just stand a chance against what would appear to be every other Orbot on the planet. Awesome 3D graphics and smooth animation give VECTORMAN the look and feel of a coin-operated classic. The year is 2049 and the planet is in total disarray. Earth's human inhabitants have temporarily headed for the stars and left mechanical robots called "orbots" to clean up their mess. Under the guidance of Raster, the orbot leader, everything was running smoothly until an attendant accidentally replaced his head with an atomic bomb. The newly transformed Raster became the evil WarHead and immediately ordered the orbots to stop cleaning up the planet and begin manufacturing weapons for use in ambushing the returning humans. Only one orbot, a sludge barge pilot by the name of VectorMan, was unaffected by WarHead's mind-controlling scheme. He was out of communications range at the time of the takeover. 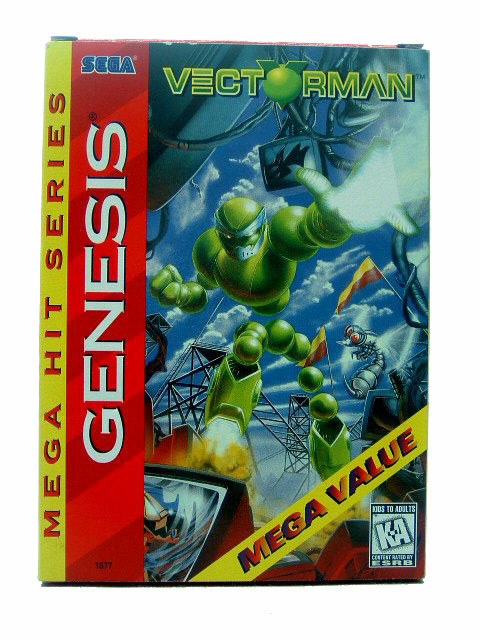 This is where you come in, fearless gamer, as it is your duty to save the human race by guiding VectorMan through 16 levels of danger-filled action. You must seek out WarHead by following a trail of television receivers around the planet. Once you catch up to old bomb head, you must confront him in an Earth-shattering battle to end all battles. Each time you destroy a television receiver, you will earn a weapon, a morph icon or a power-up. Power-ups include 1-Ups, extra time, multipliers, health points, save points and photons. VectorMan begins the game equipped with a ball gun and can trade it in for a rapid fire gun, a wave gun, a bolo gun, an orb or a nucleus shield. When the ammunition for a particular weapon runs out, VectorMan will get his standard ball gun back. With his weapons he must ward of a host of orbots, including grenade-launching Howitzers and ground-shaking Sludge Pilots. When VectorMan picks up a morph icon, he will be transformed into one of seven different shapes: a drill, a bomb, a jet, a fish, a missile, a parachute or a buggy. Depending on the shape, these transformations allow him to perform useful tasks, such as drill through floors, fly to higher areas and swim faster. VectorMan will also be transformed during three Boss Rounds in which our hero must take on WarHead. He'll turn into a dancin' fool at the Disco, a train on the Levitating Tracks, and a cricket on the Rolling Mat. VectorMan offers three levels of difficulty: Lame, Wicked and Insane.